Intel has previewed the next generation Atom processor at Computex in Taipei. In his keynote speech earlier today, Executive Vice President Sean Maloney talked up the chip – codenamed "Pine Trail" - as having better performance and lower power consumption. "Pine Trail" will also be a two-chip platform versus today's three-chip platform, with graphics and memory controller moving onto the processor. Intel says this will result in a smaller overall footprint that will enable smaller, thinner designs and lower platform cost. In addition, Maloney showed a 2.0 beta of the Moblin operating system project for netbooks. As you'd expect, Intel promises that Moblin will have a rich user interface combined with better system responsiveness and fast boot times. Mahoney also introduced four new ultra low voltage (ULV) processors were also previewed at the event as well as extending standard voltage (SV) Core 2 Duo chips to 3.06GHz. The corporation believes the ULV chips will be a more powerful extension of the lightweight laptop market - cheap and lightweight ultra-thin laptops less than 1-inch thick. The corporation believes that the ultra-thin segment will be a large market for the company. Intel also announced it plans to ship new chipsets that will make HD content available to mainstream desktops by the end of the year. The corporation also plans to ship the accompanying Lynnfield and Clarksfield (Nehalem) processors around the same time. The first Westmere 32nm chips will follow "soon after". 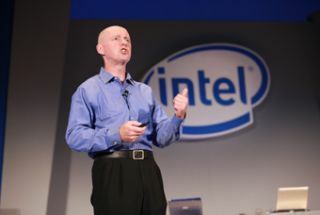 Finally, Mahoney also disclosed an initiative Intel is working on in India called "Project Blue" that combines affordable nettops based on the Intel Atom processor with WiMAX connectivity. Intel is still talking up WiMAX, even if it doesn't seem to be preaching its usefulness for developed economies quite so vociferously as it did.